Italian Frying peppers range from lime citron to deep forest green and are 20 to 25 centimeters long with a curving convoluted shape. They quickly ripen to a bright red color when fully mature. The walls are thin and tender, encompassing few seeds that are perfectly edible and add a sweet taste to the pepper. The raw peppers are succulent and crisp, but then transform into a creamy smoky treat when cooked. They offer the perfect combination of sweetness and crunch, with a complex yet delicate roasted flavor. Italian Frying peppers may be found year-round with peak season in the summer. Italian Frying peppers are a variety of Capsicum annuum, and may also be commonly referred to as Italianelles or Sweet Italian Long peppers. Unlike some peppers that are unpleasantly bitter and acrid when unripe, the Italian Frying peppers are sweet and delicious in all stages of ripeness, whether green, yellow or red. A commonly found Italian heirloom seed variety of this species is the “Jimmy Nardello”. Like most peppers in the family, Italian Frying peppers are rich in vitamins C, B6 and A, antioxidants, carotenoids and flavonoids. 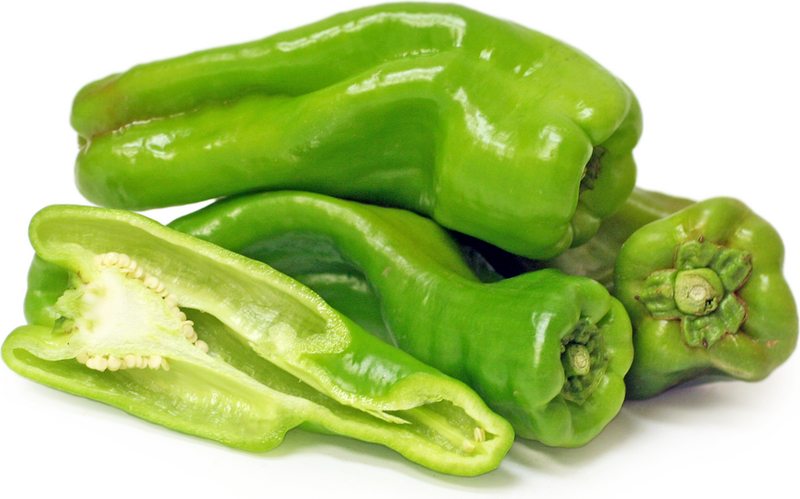 Italian Frying peppers are usually eaten whole, seeds and all, sautéed, grilled, charred, fried, baked and stuffed. Many recipes are beautifully simple involving nothing more than a hot pan, salt and a sprinkling of parmesan cheese. Their verdant pepper flavor compliments basil, thyme, parsley, garlic, onion, pine nuts, sausage and cheeses such as feta, goat, mozzarella, Parmesan, Fontina, provolone, gruyere and Gouda. Italian Frying peppers are a vigorous plant that can grow in most temperate climates with moderate rainfall. They thrive during the heat of summer and are usually mature for harvest within 60-70 days of germination. The seeds of the Jimmy Nardello variety were donated in 1983 to Seed Savers Exchange for preservation by the peppers namesake, the son of Giuseppe and Angela Nardello. They were originally brought over from the Southern Italian coastal town of Ruoti when the family moved to America in 1887. Recipes that include Italian Frying Pepper. One is easiest, three is harder.